determination and faith. 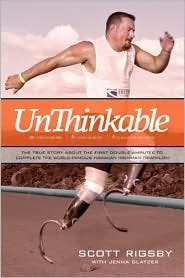 Unthinkable releases simultaneously in both hardcover and softcover. A portion of the proceeds will go to the Scott Rigsby Foundation, a Georgia-based non-profit organization dedicated to inspire, inform, and enable physically challenged individuals with loss of limb or mobility to live an active lifestyle. The book is available at www.amazon.com, barnesandnoble.com, booksamillion.com, and at other booksellers nat ionwide. in Kona–Kailua, Hawaii. Scott grew up in Georgia, where he still makes his home today. He is the founder of The Scott Rigsby Foundation, a Georgia–based nonprofit organization that exists to inspire and support challenged athletes. Scott has delivered keynote speeches for civic organizations, Fortune 1000 companies and schools across the country, and in 2008 was named World Vision's Advocate for Children with Disabilities. 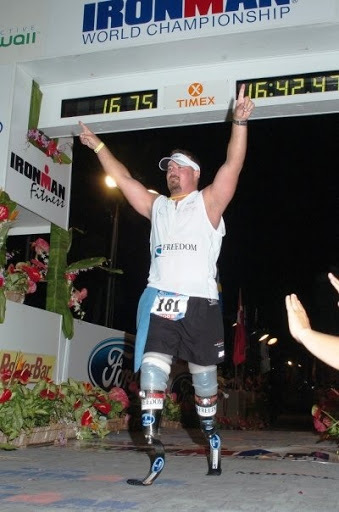 His story has been chronicled in Runner's World, Sports Illustrated, and on FOX, CNN and NBC news. Jenna Glatzer is an award-winning full-time writer who's written 18 books and hundreds of articles for magazines and online publications such as Physical, Prevention, Woman’s World, Woman’s Own, USAA, Women's Health & Fitness, Salon.com, ePregnancy, Contemporary Bride, Match.com, MSN, and AOL. Thank you so much for posting this, Mitch!